AKVIS Noise Buster is noise reduction software. 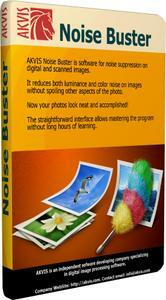 It efficiently reduces noise and grain in your images. Digital cameras opened the door to easy and entertaining photography. However, consumer digital cameras also have their drawbacks: they often produce the so-called digital noise. It can be seen as artifacts or grains that compromise the smoothness of the photo.